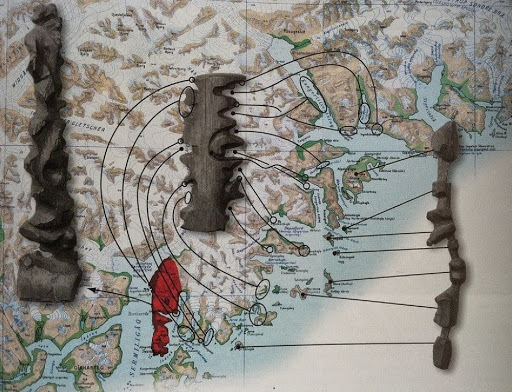 Like everybody else, the Inuit people of Greenland have been making maps to navigate the rugged coastline, but unlike maps made on paper, their maps are carved on wood that could be read in the dark by feeling. Often made of driftwood, these maps represent the contours of the coastline in a continuous line up one side of the wood and down the other. The contours of the land are highly exaggerated, allowing users to navigate entirely by feel. The navigator would often carry them under his mittens and feel the contours with his fingers to discern patterns in the coastline. Being made of wood, they are buoyant, so they float if accidentally dropped and could be easily retrieved. These three wooden maps show the journey from Sermiligaaq to Kangertittivatsiaq, on Greenland’s East Coast. The map to the right shows the islands along the coast, while the map in the middle shows the mainland and is read from one side of the block around to the other. The map to the left shows the peninsula between the Sermiligaaq and Kangertivartikajik fjords. The barren life of an Inuit family and their children in Iqaluit, Nunavut, Arctic Canada more than fifty years ago.